Precinding from using archives and documents to create his works, Naufus Ramírez-Figueroa attempts to confront historical narratives with his memory or testemony, making use of mediums such as woodcut, drawing, installation and performance. His relationship with the past, mainly the past of Latin America, is comprised of individual and collective experiences, as well as recurring references to myths. For the 32nd Bienal, Ramírez-Figueroa retrieves the play Corazón del espantapájaros [Heart of the Scarecrow] (2015-2016), written in 1962 by Guatemalan playwright Hugo Carrillo. Based on a new script – inspired by the original text and written by poet and fellow Guatemalan Wingston González – and in partnership with craftsmen and costume designers, Ramírez-Figueroa created masks, garments and props based on the play’s original elements: an oligarch, a dictator, a soldier, a cardinal and a scarecrow. 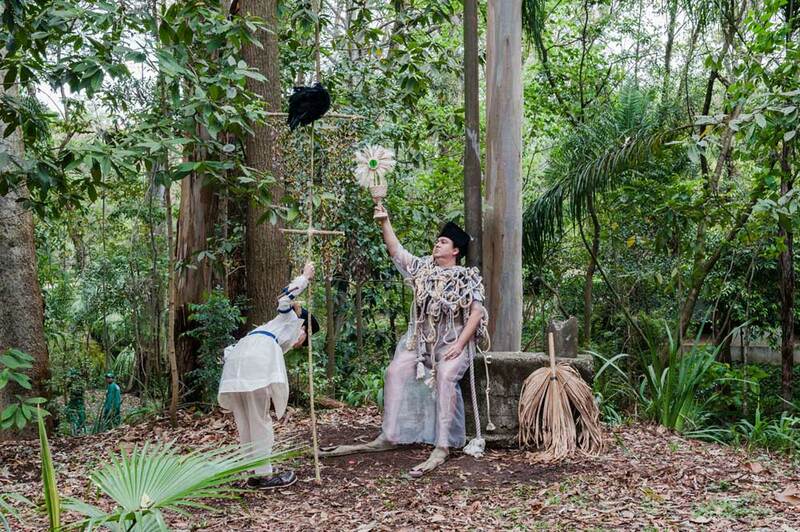 Throughout the exhibition, actors reenact excerpts from the play with these objects inside the pavilion and in Ibirapuera Park. With this project, the artist reclaims not only the memory of censorship in Guatemala, but also the actual content of the play, which is vital to the history of the theater and the leftwing political resistance practiced by his nation’s artists.